This post has been intended for the first time users who want to install GoDaddy SSL certificate in their website. The procedures described here should work well with Apache server and with Nginx. To install a digital certificate, you must first generate and submit a Certificate Signing Request (CSR) to the Certification Authority (CA). 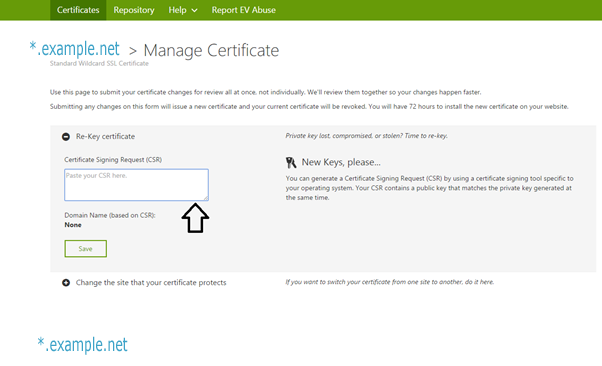 The CSR contains your certificate-application information, including your public key. Use your Web server software to generate the CSR, which will also create your public/private key pair used for encrypting and decrypting secure transactions. If you send a certification sending request for a domain hosted by Godaddy, you do not have to generate and submit CSR because GoDaddy will that for you. Note: in the above command line, you need to replace the domain name with your domain name. For example, if your domain name is example.com, you can type example.key and example.csr. The same procedure is valid if you want to install SSL in your Apache server. Though passpharase is optional, you can use a passphrase to make your SSL protect against additional risks. Open the CSR in a text editor and copy all of the text. The location of the CSR will be the location where you typed the openssl command to create the key. In the location you will find two files: one is yourdomain.key and another is yourdomain.csr. your private key will be yourdomain.key and you can rename it as per your requirements. Log in to your Godaddy account. Click on SSL certificates and then click on ‘Manage’. Next click on the ‘View Status’. Click on ‘Manage’ and then click on “Re-Key certificate “Paste the full CSR into the SSL request area in your account and click on ‘SAVE’. Download the cert file and the bundle file from Godaddy and then upload it to the /etc/ssl/certs folder. Also you need to put the private key file in the /etc/ssl/private directory. Make sure you mention the location of the cert and key files in config file of the web service that is installed in your webserver. Scenario: You have installed your wildcard certificate in a server, and now want to add that cert in a second server. To create pkcs12 file, you can use Ubuntu Linux or use https://www.sslshopper.com/ssl-converter.html. I used Ubuntu Linux because I already had Ubuntu installed and it has a built in pkcs12 functionality. Then, install this gd_intermediate.crt (pem) file in the ASDM CA. Finally, click on identify certificate in the ASA, and then select pkcs12 file that you generate in Ubuntu. type the passphrase that you created with the p12 file. and install the certificate. To apply the certificate, go to device management and then click on Advanced and then ssl settings. click on edit button of outside interface and select the identity certificate that you created earlier. If you have any questions and thoughts about wildcard SSL certification, please share your feedback with us.